In the following lines I provide a brief calendar of the relevant elections ahead. Following this I summarise the likely outcome of these elections in light of the present and past voter intention surveys. It seems Europe is looking at some shaky months ahead of itself. March 10 – Slovak Parliamentary elections. You might have forgotten, but the election was triggered back in June in a bargain to get an EFSF reform passed. This has led to the impossibility of Slovakia to make European commitments ever since. April 22 – First Round of French Presidential election. April – May – Snap Parliamentary elections in Greece. The precise date has not yet been announced, but it is rumoured that as likely to fall on April 29 or May 6. May 6 – Second Round of French Presidential election. June 10 – First Round of French Parliamentary election. June 17 – Second Round of French Parliamentary election. September – Parliamentary elections in Austria. October 8 – Presidential elections in Slovenia. October – Parliamentary elections in Lithuania. October – Parliamentary elections in the Czech Republic. November – Parliamentary elections in Romania. February – Cypriot Presidential elections. March – Maltese Parliamentary elections. 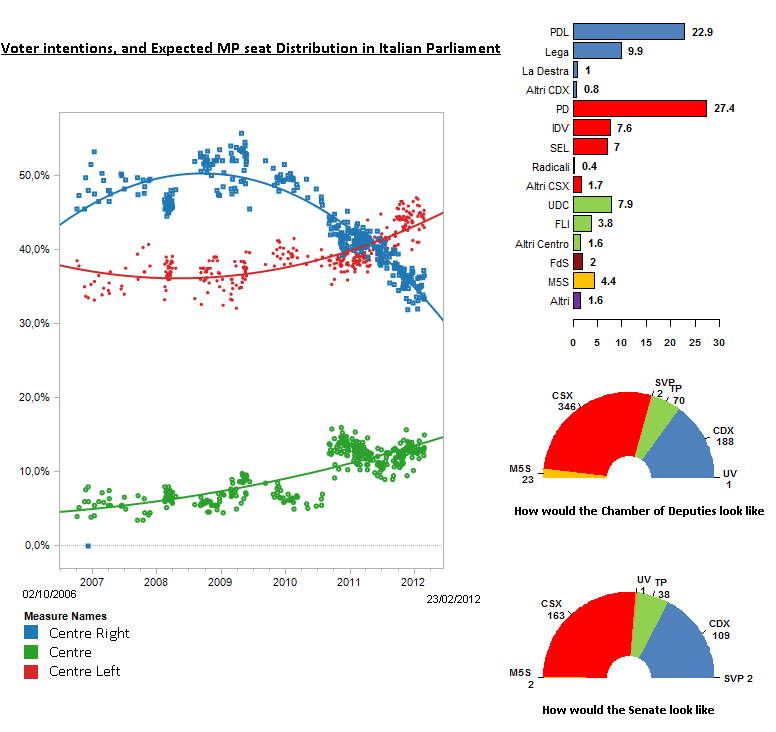 April – Italian Parliamentary elections. While I have heard rumours that a snap election is coming soon, I have not found any evidence nor media support pointing in that direction yet. Clearly, while market and ECB pressure will remain, national politicians are likely to remain calm and not call for early elections. This is somewhat the indication in the latest Bloomberg article on this issue. June-July – Bulgarian Parliamentary election. September(?) – Federal German parliamentary elections. Although the date has not yet been announced, but if the last 4 such elections are indicative, it should take place in September. Below I discuss only the voter intentions of Greek, French, Italian and German voters. Although in the future, I will strive to find similar information for the rest of the EU, and particularly for the Central and Eastern European Member States, this analysis is not yet up to that standard. Greek voters’ intentions have shifted as a result of the Greek sovereign crisis. This has led to a drastic fall in the support by the traditional mass parties of the center left and right, PASOK and New Democracy, to the benefit of more radical parties on both extremes of the political spectrum. Embarrassingly, the best information on this is provided by Wikipedia’s website on the next Greek election. MRB, a Greek public opinion surveyor, also provides data on the issue. However, it is less complete and does not provide links to the actual sources, which Wikipedia does. While New democracy lost support due to the frauds committed in government up to the end 2009, PASOK has lost support due to its apparent inability to stand up for Greece’s society and its quality of life. I more ways than one PASOK is suffering the pain of being a proxy for Germany. Germany, due to its Schadenfreude, has become hated by the Greeks. The French presidential election promises to be a momentous occasion in French, but also in European politics. If François Hollande is able to maintain his advantage for the next month, he will be well placed to be only the second socialist president in the history of the fifth French Republic. Given the lead that he enjoys, and in the absence of some prehistoric reflex a la DSK, the left’s victory in France should be guaranteed. The graphics below are taken from “Sondages en France“. I expect the Socialist to be extremely careful and combative in light of the 2002 presidential election disaster. As the calendar above mentioned, the Italian parliamentary election is at most a year away. However it is not impossible for a majority of the Italian parliamentary deputies to withdraw its support between now and then. While we might still have to wait for a year, it is still important to consider the implications of a possible election. The figure below point to the fact that while no party is likely to hold a majority of the seats, a coalition of the center left would right now be able to do so. While these facts could be seen as an incentive for the left to bring down the present technocratic government, such a move would most likely bring Italian sovereign yields up and the popularity of the left down. So, unless Monti himself calls early elections, it is likely that the situation will remain contained in the present form for a year. In a previous post, I hypothesised that the federal CDU/FDP coalition government in Germany was likely to fall before the likely September 2013 deadline for the Bundestag (German federal chamber of deputies). While this has not yet happened, it is still rather likely. For now, I will abstain from developing this argument, which I hope to dedicate sufficient attention to in a later post. For now, the emphasis is on voter intentions. There has been a great change in the dynamics since my 2011 post. For one, the CDU continues to be in the lead according to voter intention surveys, and looks stronger than it has in a long time, despite the complete annihilation of its coalition partner in the pools. Indeed, the FDP remains at risk of not even making it into parliament. 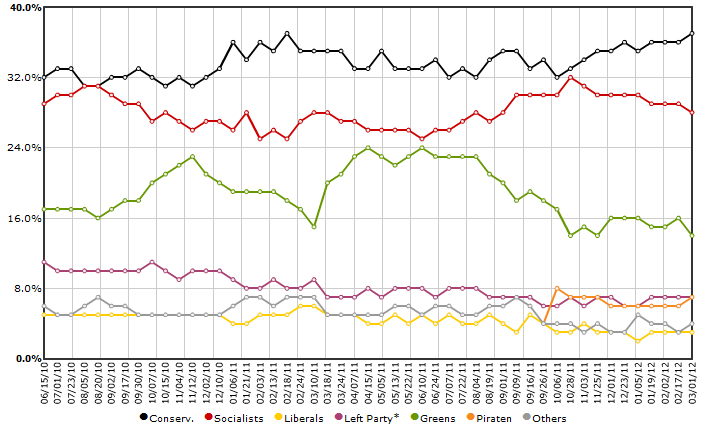 The most marking event however, is the fall from grace of the Greens which at some point even looked likely to become the senior party in a Green/SPD coalition. Its demise and the relative loss of support of the SPD mean that any center left coalition in Germany would require the support of Der Link (The Left) and possibly even of the Pirate party. European politics is scheduled to take on some interesting twists and turns in the next year and a half. Much will change in the next year, but as usual much will also stay the same. I expect these political facts to ally themselves with economic and social ones and conspire to plunge Europe once again into turmoil. Until then, enjoy the calm before the storm. 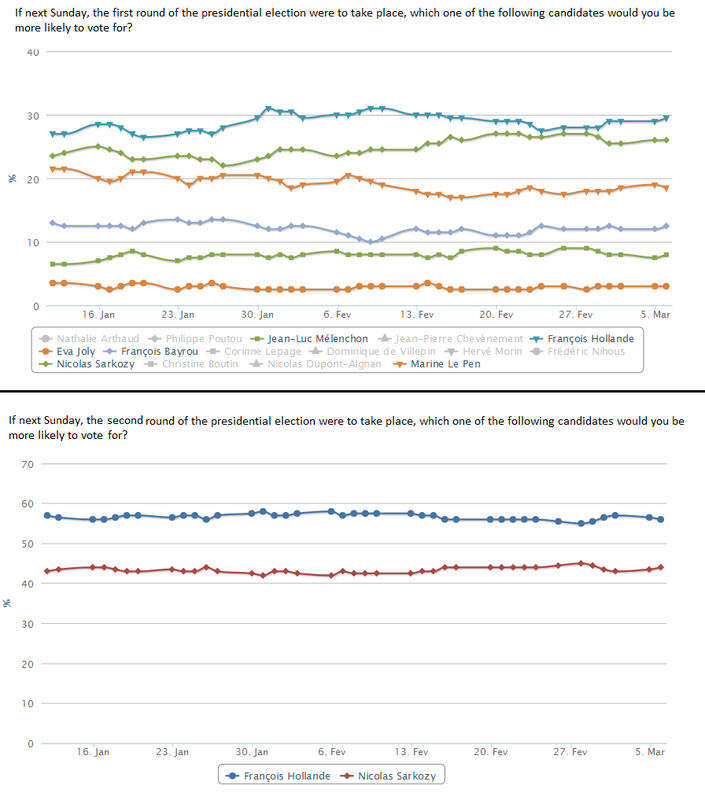 Note: An updated review of upcoming elections and voter intentions for 2013 can be found here. This entry was posted in Risk Scenario Analysis, Uncategorized and tagged 2012, 2013, Austrian Elections 2013, Beppe Grillo, Berlusconi, Bulgaria, Calendars, CDU, Czech Republic, Der Linke, Elections, FDP, France, Germany, Greece, Hollande, Italy, Lithuania, Merkel, Monti, New Democracy, Papademos, PASOK, Pirate Party, Slovakia, Slovenia, SPD, Voter intention polls, Voter intention surveys. Bookmark the permalink. The info at electionguide.org about Austria is wrong. The term of parliament was extended to five years (which was not even discussed at any length, they just did it ::argh::), so the next elections are in 2013. Good commentary. I follow the same stuff. Are you on twitter? I am glad you liked it. Please find me ” @placeduluxemb ” on Twitter. Alternatively, Facebook or email (placeduluxembourg@hotmail.com) also works! august 18, 2012 — you do not seem up-to-date, e.g., france, greece. am I wrong? You are absolutely right. This post is not up-to-date. You will notice that it was written in March, before those elections actually took place. You will also notice the conspicuous absence of the Dutch election due to take place on September 12th, because it was only announced on April 23rd. I will probably write another election themed post sometime between October and December, when more new information. Until then, thank you for giving me the opportunity to explain the outdatedness of the post. Er… The circumstance that in the Austrian survey graph the FPÖ is indicated as FPK is due to the fact that indeed these surveys don’t refer to Austria as a whole, but only to Carinthia (where the local section of the FPÖ split from the main party some years ago, changing their name to “Freedomites in Carinthia”, or FPK). Whereas the FPK is indeed stronger then the centre-right ÖVP *in Carinthina*, on the national Austrian level the ÖVP is still the second party (a current survey has the SPÖ at 27, ÖVP at 26, FPÖ at 21, Greens at 13, and Frank Stronach at 7 per cent, see http://neuwal.com/index.php/2013/01/26/wahlumfrage-osterreich-karmasin-januar-2013/ ). So the most likely outcome of the Austrian elections will be a continuation of the current SPÖ-ÖVP coalition. And as to Germany, we can probably rule out a CDU-SPD-Greens coalition, as CDU and SPD (or CDU and Greens) will easily have a majority without a third party. Thank you so much for the correction. I have made the necessary changes.Your correction is very much appreciated!